St Mary’s Hamilton regularly host groups of pilgrims from Interstate and Overseas who travel the South West of Victoria and South Australia to visit significant MacKillop sites. Groups are escorted to visit the St Mary’s Church and celebrate Mass, the old Cemetery for prayer and reflection at Alexander MacKillop’s grave and the Anglican Church to view the icon of Mary MacKillop. Their hosts are Ted Oliver and Marie Cook plus a band of parishioners who make their stay in Hamilton very welcome with meals and hospitality. All funds raised go to Sister Jean Dwyer of St Joseph’s Corner, Yarraville to assist with her work in Drug and Alcohol Rehabilitation. Mary MacKillop’s father – Alexander was born 21 January 1812 in the Highlands of Scotland. At the age of 12 he went to Rome to study for the priesthood. Alexander spent 9 years in Rome and was a precocious and talented student. With ill health and too young to be ordained, he was forced to return to Scotland in 1831. He studied at Blairs College in Aberdeen before returning home once again in 1833. Alexander remained an independent thinker, prolific writer and a formidable opponent in philosophical and theological debate. He left for Australia in the sailing ship “Brilliant” in October 1837, arriving at Sydney Cove on 20 January 1838. He worked successfully for some time in Sydney before moving to Melbourne. Mary MacKillop’s mother – Flora was also a native of the Highlands of Scotland and came to Australia with her family on the “Glen Huntley”, arriving in Melbourne on 17 April 1840. Within a short period of time Alexander and Flora were married at St Francis Church, Melbourne by Fr. Geoghegan on 14 July 1840. “A gentle winsome woman” is how Mary described her mother many years later. 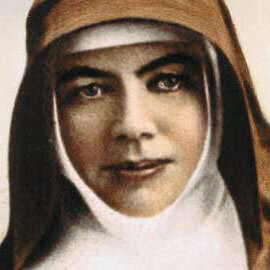 Mary Helen MacKillop – first born child of Alexander and Flora on 15 January 1842 and baptized 28 February 1842. There were seven other children: Margaret, John, Alexander, Anne, Alexandrina, Donald and Peter. The MacKillop family – while very strong in faith – experienced many difficulties. Alexander stood for parliament twice without any success, but each time he accepted defeat good-humouredly. While he appeared to fail financially and socially, he publicly raised the lack of educational opportunities for children in remote parts of the Colony. His eldest daughter Mary was later to redress this need. Alexander had a strong social conscience and ensured that Mary acquired a good education. In the 1850’s the MacKillop family moved constantly, with Mary playing a major part in maintaining the well-being of the family through those years. In late 1863 after gaining a teaching position in Portland, the scattered MacKillop family joined Mary in Portland’s Bay View Cottage. To support her family Mary established her first school – a school for young ladies. All did not go well for this venture or for the family. The tensions that grew in the family were attributed mainly to Alexander. It was decided in 1866 that he go to Dunkeld to his youngest brother, Peter. In November 1866 Mary announced her wish to enter religion with the approval of her mother and father whom she called ‘Poor Papa’. She retained a deep and abiding affection for him. Under the guidance of Fr Julian Tenison Woods, Mary set up her first school in a stable remodelled by her carpenter brother, John. She had prayed wholeheartedly to St Joseph to help them find a suitable building to rent. Mary was joined in Penola by her two sisters, Anne and Lexie. Fifty-five children enrolled for the opening. Mary wore a ‘simple black dress. • 1867 – 15 August – Mary’s First Profession – Mary of the Cross. • 1867 & 1868 – The Sisters of St Joseph opened schools, orphanages and refuges in Adelaide. • 1868 – 19 December – Alexander MacKillop died at Victoria Hotel Hamilton Vic. Buried in Hamilton Cemetery. • 1871 – 22 September – Mary excommunicated by Bishop Sheil for alleged disobedience to his new rule. The Bishop had become quite erratic in his decision making and was being advised by some jealous trouble makers. During this time, Mary and her sisters were given hospitality by various benefactors, including a Jew – Mr Solomon and Fr. Woods’ brother. Fr Tappeiner S J became Mary’s spiritual director encouraging her to be at peace, saying that he believed the excommunication to be invalid. • 1872 – 23 February – Mary’s excommunication is lifted. The dying Bishop regretted his earlier decision. • 1873 – Mary visited Rome and received the blessing of Pope Pius IX. She visited other places, Loreto Paray-le-Monial in France and her homeland, Scotland. The work of the Sisters of St Joseph spread rapidly, continuing to bear many hardships from individual diocesan authorities. Their rule was finally approved by Rome in 1888 when their wish for Central Government was approved and upheld with the Mother House in North Sydney. • 1886 – Flora MacKillop drowned in shipwreck near Eden. • 1889 – Fr. Tenison Wood died. • 1909 – 8 August Mary MacKillop died. • 1995 – 19 January Mary declared Blessed by Pope John Paul II in ceremony at Randwick Racecourse Sydney. • 2008 – Cause for canonisation proceeds. The second miracle needed taken to Rome to be examined by panel of medical and theological experts. • 2008 – 17 July Pope Benedict XVI visits Mother House in North Sydney. • 2010 – Mary MacKillop canonised as a Saint on October 17, 2010.